A Chinese Long March 2D rocket launches two SuperView1 Earth observation satellites into orbit from the Taiyuan Satellite Launch Center on Wednesday, Dec. 28, 2016. Two commercial Earth-observation satellites launched by China on Wednesday (Dec. 28) are not in their intended orbits, according the launch news website Spaceflight Now. "The satellites would likely re-enter Earth's atmosphere within months in such a low orbit, and it was unclear late Wednesday whether the craft had enough propellant to raise their altitudes," Spaceflight Now reports. You can learn more details about China's commercial SuperView 1 satellites in Spaceflight Now's full story here. 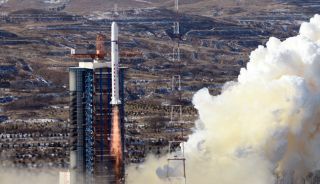 The Long March 2D launch of the two satellites followed just one week after China's successful launch of TanSat, a carbon dioxide mapping satellite, aboard a Long March 2D rocket on Dec. 21 from the country's Jiuquan satellite launch center. The country also launched the next-generation weather satellite Fengyun-4 aboard a Long March 3B rocket on Dec. 10 from the Xichang satellite launch center.